Panoramic prints are custom-ordered, so please contact us via the Contact link on the navigation menu on the left and we will assist you in getting the perfect picture. The rising sun colors the sky as the city begins its day. A few sailboats peacefully float atop the ocean as the water coalesces into the Marina Del Rey beach. Palm trees line the walkway of the Pacific Palisades as delicate cirrus clouds reflect the sunset colors onto the ocean from the Santa Monica Pier to the Santa Monica Mountains. The fading sunlight squints through a massive cloud layer above the Los Angeles basin as viewed from the Hacienda Hills near Turnbull Canyon. The chill of the Mojave Desert night takes hold as the warmth of the sun withdraws over the San Bernardino Mountain range. A seagull watches the sun dip below the Huntington Beach pier with Christmas decorations hanging from the light poles. The full moon rises over the San Gabriel Mountains behind downtown Los Angeles as viewed from Kenneth Hahn State Recreation Area. Only the tips of the Golden Gate Bridge are visible as the fog obscures everything below during the sunset in San Francisco. Joshua Trees watch the moon rise as the sun sets. Dams normally block water; in this case, the river is dry but the Sepulveda Dam still manages to intercept the golden light of the fading sun. The setting sun is aligned through the streets of Manhattan, New York City only twice a year. On the other side of the country, the setting sun is aligned through the piles of the Manhattan Beach pier much more often but is still a beautiful sight.  People play on the beach as the last rays of the sun light up the sky and ocean with silhouetted lifeguard towers and palm trees. Fireworks burst over San Francisco in celebration of Fleet Week. The sun sets over downtown Los Angeles and the Sixth Street Bridge. Griffith Observatory was completely packed with people watching the lunar eclipse. A few of them stayed around to watch the sun rise over downtown Los Angeles the morning after. Violet clouds hover over the Huntington Beach Pier just before sunrise. The rays of the rising sun travel down Sahara Ave in Las Vegas. The Ferry Building stands alone in the otherwise empty space between the crowded skyscrapers of the financial district. Water peeking out from cover of ice mirrors the clouds and mountains above Gull Lake. A wave splashes over a sleeping sea lion at La Jolla. Joshua Trees are silhouetted by red clouds in Hesperia. A sea lion rests with its head arched back during sunset in La Jolla. The setting sun slips behind the Marin Headlands as the Golden Gate Bridge dwarfs two birds soaring above it. 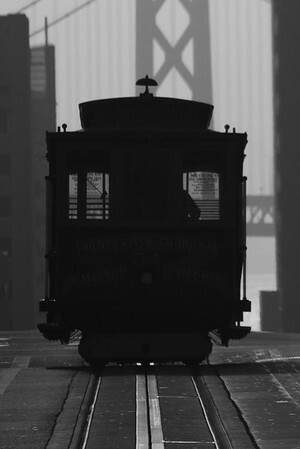 Cable car cresting the hill in front of the Bay Bridge. 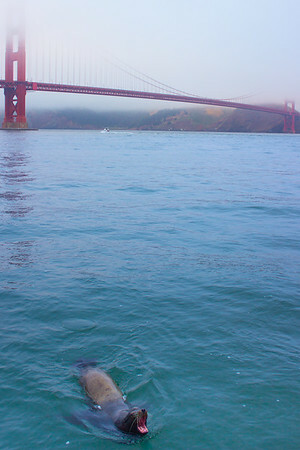 A sea lion barks from the water in front of the Golden Gate Bridge. 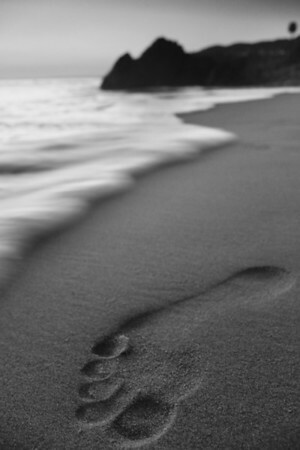 A footprint with a millionth of a year to exist; a tree with hundreds, a rock with thousands, and an ocean with billions.